Our Woodfired Oven Cooking classes are full of information, inspiration and confidence building cooking. Whether you are an experienced woodfired cook, catering professional, have a new woodfired oven at home or are just thinking about getting one, you’ll find plenty to learn. We’ve been using woodfired ovens for well over 10 years and teaching woodfired cooking since 2008. Our relaxed, informative courses are hugely popular, with students coming from all over the country and increasingly further afield. Our classes take place in our purpose built, year-round wood fired kitchen and on our summer terrace. You’ll learn everything you need to know about using your own wood fired oven. If you haven’t got one yet, don’t worry – many students come for research before investing in their own. We also run a series of wood-fired events at Humble By Nature near Monmouth. We can run private classes at the school or at your own home or commercial premises at a mutually convenient date. Ideal if you are short of time or who would like to learn on your own oven. To book any classes email us or call us on 01803 752943. “We found Manna from Devon on the internet. Our primary focus was a course to learn more about cooking in a woodfired oven. Such courses, apart from the 2-3 hour type aimed at tourists, are thin on the ground. While there are quite a few in the USA, Australia doesn’t seem to have anything serious. Even Italy, which would have been our first choice, doesn’t have much in this specialised area. The website was very informative and, probably most importantly, believable. When you are sourcing woodfired oven schools you don’t start out thinking Devon! So initially there was a credibility hump to get over and the website achieved that. We really had the confidence after doing some research that David and Holly knew what they were about. We try and visit Europe each year, so it was relatively easy to plan our annual holiday around the two courses. It was very convenient to have the breadmaking and wood oven courses on successive weekends. When we started talking with Holly at the end of 2016 she hadn’t yet finalised their programme, so was able to accommodate us when we explained what we were interested in. The booking process was very easy. The website is easy to use and together with email correspondence it all went smoothly. It was a bonus staying in their very comfortable accommodation, and we enjoyed our time with them, both in and out of school. Dartmouth is delightful and has many good restaurants, although we weren’t very hungry after eating all the food that was cooked. We'll teach you how to use your oven too full effect and inspire you to do some brilliant cooking. During this confidence building class we'll use our ovens for a typical day's baking. The ideal class for Morso, Alfa and other metal construction ovens. The easiest, most versatile and fun to make breads are flat breads. Made all over the world and incredibly versatile. Learn with the experts as we demonstrate how amazingly versatile a wood-fired oven can be. Advanced techniques for wood-fired cooking. 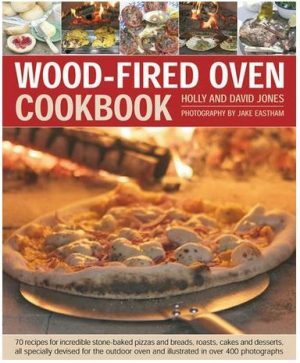 Our first wood fired book, published in 2012, will provide everything you need to use your oven to its full potential. Lots of information as well over 70 inspirational recipes. You can order it from us or pick up a copy from the school priced just £9.99. Alternatively get it online from Amazon. Our second book was published in December 2016. 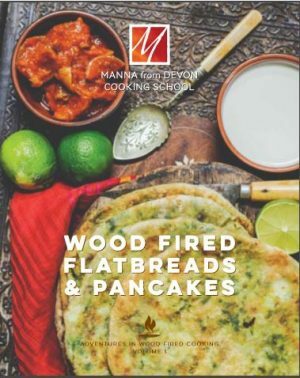 In it we have explored the amazingly varied world of Flatbreads and Pancakes from around the world, many of them discvered during our own travels. Read what Sunday Telegraph Journalist Fiona Sims had to say about our classes.